The theme for the new Ditzy-Craftymessers Challenge starting today is Buttons. Your challenge project can be anything, just as long as YOU made it and, of course, it has Buttons on it. 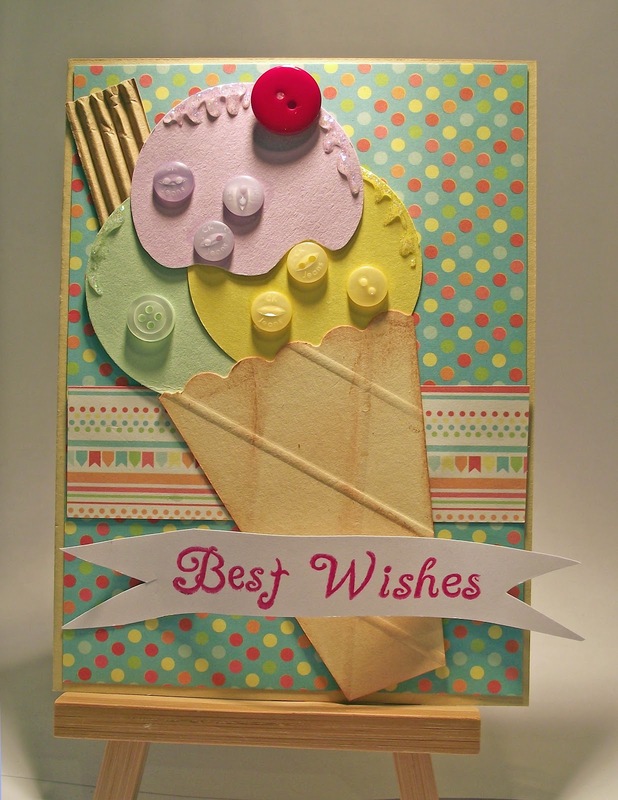 A standard Kraft card base with some patterned paper frm the 6 x6 pack of Freebies in Quick Cards issue 96. I cut a band of coordinating paper from the same stack and attached it to the patterned paper, almost at the middle of the card. The Ice-cream was made with a cone shape cut from Kraft card and scored using my Crafters Companion scoring board in a lattice pattern and rubbed over with Vintage Photo distress ink. The scalloped edge was made with a Fiskars edging punch. The ice-cream flavours were punched from pale green, yellow and lilac cardstock and arranged to form the ice-cream. some buttons in matching colours were adhered using glue dots and the 'cherry' on the top too! The chocolate flake is a piece of light brown ripple card. The senitment was stamped in red onto a banner shape and adhered with dimensional adhesive. A few squiggles of Diamond Stickles along the top of the 'ice-cream' create that melted look. Thanks for stopping by and taking the time to read my blog. Your time and comments are appreciated. This is fab Angela! Looks good enough to eat. Angela this is so different and so good .